Epoch Tiles are designed to bring life to any backsplash, shower surround, or feature wall. With its mixed mediums and contemporary styling, bring together form and function, as well as art and aesthetic. Let our designs bring some art, passion, and fun into your space. 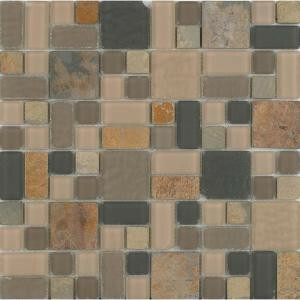 Buy online Epoch Architectural Surfaces No Ka 'Oi Hana-Ha420 Stone And Glass Blend 12 in. x 12 in. Mesh Mounted Floor & Wall Tile (5 sq. ft. / case) HANA-HA420, leave review and share Your friends.